"While March mix is still bad, the tone in the supply chain is staring to improve and price reductions in China may be starting to clear channel inventory," Timothy Arcuri from IBS said in a memo seen by AppleInsider. 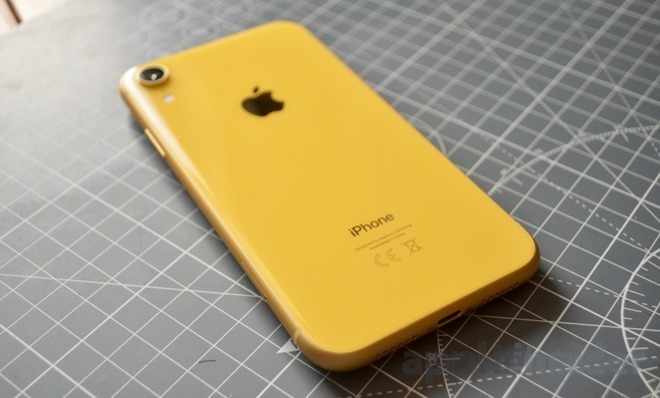 Procurement estimates for the iPhone XR are claimed to be up quarter-over-quarter in June, something unusual for an iPhone at this stage in its product cycle. UBS is boosting its June-quarter iPhone estimates from 32.5 million units to 34.5 million, though mostly on the basis that Apple is expected to sell more pre-2018 models. While UBS is predicting 3 million more iPhone XR sales, it's expecting an equal decrease in iPhone XS and iPhone XS Max shipments. That should also push iPhone ASP (average selling price) down, UBS's revised estimate for the June quarter being $655 instead of $683. Forecast revenue is nevertheless being increased from $50 billion to $50.4 billion. For the March quarter, UBS is leaving its iPhone shipment predictions unchanged at 40 million, but arguing that 5 million more of those will be pre-2018 models, offsetting reductions of 2 million for the iPhone XR, 1.5 million for the iPhone XS, and another 2 million for the iPhone XS Max. Average selling price for the iPhone has been shifted down from $711 to $687, and Apple's overall revenue from $57.5 billion to $56.5 billion, with iPhone revenues down from $30.2 billion to $29.2 billion. UBS is leaving its calendar 2019 and 2020 revenue estimates unchanged at $259 billion and $258.7 billion, respectively. Likewise it's holding onto a "buy" rating for Apple stock with a $185 price target. Apple suffered a precipitous 15 percent decline in iPhone sales during the December quarter. The company has blamed this primarily on weak sales in China, but also "foreign exchange headwinds," "economic weakness in some emerging markets," and even its discounted battery replacement program, which generated about 11 times more traffic than anticipated. The worst of the bad news was that we have reached peak iPhone sales. Is that really behind Apple now? Subscriptions are still working ,aren’t they? Android OS device have to face that same bad news, but in Apple's case at least, more device users added every day. Subscriptions, or as I like to call it "consumer serfdom". I'm sure for many people subscriptions are a great thing, but I avoid them like the plague. You pay a monthly stipend to rent something like music, and if you decide to break free of your serfdom, you are left with nothing. And you pay the same stipend even if you don't use the service/product for a period of time. I wouldn't help feeling like a sucker if I bought into a deal like that. But that's just me. Like I said, many people seem to love subscriptions, and I'm sure that is why so many companies have adopted that business model as a revenue stream. That being said, I agree with your implication that subscriptions will make up a much more significant percentage of Apple's future revenue. “Bad” is all relative. Every other vendor would kill for Apple’s “bad” numbers. It is disappointing but not bad. Have the analysts heard of the S10e S10 and S10+? Superior hardware, premium build, better looking, lower priced, clean UI. I think Apple needs to pull up its pants. Yeah I think Gruber said this was still like their third-best quarter ever or something. lol... "But but but less ka-jillion dollars!" I don't know how any quarter making Ga-$Billions would be considered bad. Except no one cares about knockoff iPhones. Nope. Android is not just Samsung - a lot more than that. In the same world market, Huawei managed to take on 50,000,000 users. An absolutely gigantic increase. Not all Android [manufacturers] faced bad news. Irrelevant. Since the stock price of $230 could have been based on the expectation of 1st biggest quarter ever. Did they make money to cover their expenses + cost of capital doing that? If you know, please provide a cite or a link to the numbers. Huawei invests a minimum of 10% of its annual revenue in R&D. It will increase that percentage for 2019. In absolute terms, and for reference, it generally spends more than Apple. I believe consolidated accounts for 2018 will be released soon. What we know at present is that $52B of the company's annual revenue for 2018 came from the consumer business group. Over 200,000,000 handsets were shipped and more than 100,000,000 non-handset devices were sold. Huawei has attributed the strong handset sales to its mid to high end phones. Consolidated results for 2018 will be declared in the company's annual report. iPhone unit sales have been flat for years. That might have a little something to do with why Apple created a new super-premium tier. With the market for high-end smartphones becoming saturated, and upgrades cycles lengthening, higher-priced phones enable them to continue growing revenue. Apple saw this coming 5+ years ago. Hmm, let’s examine. I was paying Comcast $86/month for a fairly basic cable subscription and internet connectivity. I cut that cord when I moved overseas, now living in Vietnam paying Netflix $9 and high-speed internet included in my rent. So I’m a bit of an outlier in that regard. But let’s look at Apple Music. I pay $10/month, so $120/year. I’m 56, so let’s say I continue for 30 years. That’s $3600, most of which will be paid in future [cheaper] dollars, but let’s say the subscription cost rises to match any future decline in the value of dollars. So it’s $3600 in today’s dollars for simplicity. For that money I could have purchased about 2500-3600 tracks, assuming I want to stay within the bounds of the law and reward the industry and artists for their talents and contributions. And as new music comes a,one I get none of it; stuck with my 3600 tracks for life, unless i want to pay more. On the the other hand, with an Apple Music subscription for those 30 years I get millions of tracks, any number of which I can download for offline listening, and I get new music as it comes out. What’s not to love about that deal? Please, any downside? I know more than a few people who had 6000, 10,000, and more tracks in their iTines collections. To be legal they would have had to spend a great deal more than a 30-year subscription to Apple Music or Spotify. And be stuck paying even more to maintain as new music is released. 5G networks are being launched everywhere; by Christmas a big part of civilized world will have access to 5G networks. Taking into account that phones are being used for 3 years or more before being replaced, I don't see people massively buying an expensive phone with no 5G phone connectivity during the so important Christmas period, So Apple might face a difficult 2019. But of course my guess is as good/bad as any other guess. Please don't waste our time. Huawei does not report segment operating income. It is is quite possible, for example, that the "7.5" comes from "+10" in their enterprise segment and "–2.5" in their consumer segment. Can you disprove that? Like I said, come back when you have facts. I guess if you don't care about watching things like live sporting events and news on TV then this sounds like a good call. I have no further to look than the comments on an almost adjacent story from the very same day here on AI! The article is about stuff Apple is pulling, which in this case is a Good Thing, but the comments discuss games and such that disappear. In the non-ownership world (trap) people are falling into these days, note that things you might even have paid for can disappear, let alone stuff you haven't explicitly paid for. With something like a cloud-based music service, you really have zero control over being able to listen to any specific music in the future. All notion of building a collection of music that you like goes out the window. The important thing to consider is that it may not even be possible to buy the music that you want in the future, or not on your platform of choice or not through your service of choice. Things could very well Balkanize where you'd have to subscribe separately to every publisher's service. It's impossible to know where things will end up. Because I buy my music, I'm protected. Let's follow your 30-year time frame, because that's a LONG TIME for any kind of technology or even business model. Think about the world 30 years ago to get an idea. We had essentially no internet, or at least no web or connectivity for most people. Geeks had (very slow) dial-up, email was mostly corporate, AOL hadn't really even gotten going in earnest yet. Cell phones? Um. What is the tech landscape going to look like 30 years from now?! More to the point of music. Unless you've actually purchased your music, whether physical or digital, you have no guarantee of being able to play it in the future. Apple is actually pretty good about not abandoning their users, compared with many other companies, but in the case of music it's not just in their hands. They have millions of songs available, but the vast majority of them are licensed through big music publishers, right? If (or when) they decide to pull the plug, you'll have to start over from scratch. Remember, it wasn't that long ago, in the big scheme of tech and licensing, when music publishers didn't want to work with Apple. It's not a stretch to think that it could happen again, especially when we're talking about a long time frame like 30 years. Apple won't look like the same company it is today; it may not even be a leader in phones or music or any of what we think of today when we think of Apple. I'm not saying that these subscriptions services are always going to be a bad deal for everyone, but in general, I think they're not as good a deal for most consumers as they think, especially when they end up in a position of not being able to quit without losing everything. Kind of like facebook addiction, where most people really don't even like the company, but they feel like they don't have any other option. Another potential downside is that you're making the assumption that the prices will stay the same for 30 years (or even be in cheaper future dollars). That's not likely to be the case because prices for most services (as opposed to hardware) tend to creep (or jump!) up over time. And again, it's not just Apple's costs and margins that come into play, but the negotiated licensing fees, which are likely to go up over time as well. Another possible downside: I don't know if you have kids or nieces/nephews or friends that you'd ever like to pass your music collection to some day when you're gone, but I like the idea that my kids will be able to sift through all of mine and choose whatever they like and own it for as long as they have the ability to rip the data from the discs. I still have many of my mother's old 45s and even some 78s, and while it's not trivial for me to play them, they're very cool, and I could buy a cheap converter and rip them all if or when I choose to do so. Much of my own personal CD collection has been ripped already, so the data is likely to live in a playable format for many decades. All the songs that I've purchased from iTunes are savable offline and can never be taken away from me or my descendants. Yep, I'm sure I had more than 6,000 songs even before there was such a thing as iTunes, let alone streaming services. YMMV, but you asked for downsides, and those are just what I came up with off the top of my head.